The Single Father's Guide: Are you a "Bisquick Dad?" Are you a "Bisquick Dad?" No kidding. It’s completely all right to be a "Bisquick Dad." So, what is a Bisquick Dad? Well, in short, a Bisquick Dad is a good man who has taken responsibility for his children, regardless of any other circumstances, and tries his best to make healthy meals for his family and himself. He often solicits the assistance of products including, but not limited to, Bisquick, Hamburger Helper, Rice-A-Roni, Kraft Mac & Cheese Dinners, and so forth. The cool thing, Bisquick Dad, is the fact that you are an active caring father for your children. Not every dad is a Julliard-trained chef. I’m certainly not, but what I am is an experienced single father and I have learned by making many, many mistakes. Considering my numerous trials and even more numerous errors, I have found a number of ways to help keep my kidlings healthy and fit through diet. One of my tricks includes substituting healthier ingredient for basic, Bisquick Dad recipes. 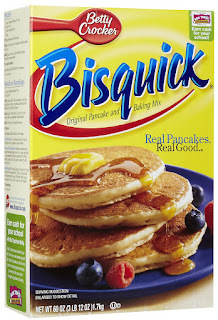 So, here’s a suggestion for the next time you make pancakes for your brood and use Bisquick. 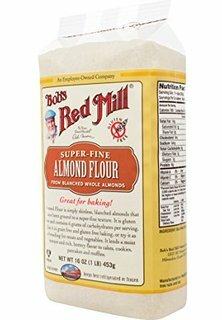 Get more protein in your children's diets by substitute a half a cup of Bob’s Red Mill Almond Flour for a half a cup of Bisquick. By doing so, you’ll be replacing that half of a cup of almost pure carbohydrates, 42 grams compared to 12 grams, with a half a cup of almost pure protein, 4.5 grams compared to 14 grams. Don’t stop there. As I’d blogged a few weeks ago, by substituting Fairlife 2% Milk, the protein doubles from about 7 grams to about 13 grams per cup. And, finally, consider replacing the couple of eggs in the Bisquick recipe with egg whites. The egg whiles will cut 125 calories, 10 grams of fat, and a whopping 370 milligrams of cholesterol. So, with those little changes, Bisquick Dad, you’ve made a healthier pancake/waffle/biscuit for your progeny while giving them the energy to take on their day. Now, if you can only get them to do their homework when they get home from school.